You’re about to take flight. You may be feeling a lot of different things: excited, uncertain, stressed, worried, anxious. Luckily, there are lots of things you can do to take control and fly calm. The Fly Calm website is an initiative developed by CMHA and Vancouver International Airport (YVR). You’ve checked in for your flight. Now take a moment to check in with yourself. What do you notice? Tensed muscles, shallow breathing, a faster heart rate or an unsettled stomach are some signs that your stress levels are high. You may also notice that you skipped a meal and need to eat. Notice the sensations and accept how you’re feeling without judgement. Deep, slow breathing actually changes the information going to your brain and tells your body it’s okay to relax. Try the Box Breathing relaxation technique. Breathe in slowly and deeply for four counts. As you breathe in, try to fill the very bottom of your lungs with air. You should feel your stomach move out—try putting a hand on your stomach and seeing how far you can push it out. Hold your breath for four counts. Exhale slowly for four counts. Hold your breath for four counts. Continue the pattern of breathing in for four counts, holding your breath for four counts, exhaling for four counts, and holding your breath for four counts. If you find the four-count too difficult, reduce the count to two or three. If the four-count is easy, try adding a count or two. If you can, check your bags or lighten your load so you have more freedom to walk around. Movement is one of the best ways to relieve stress. 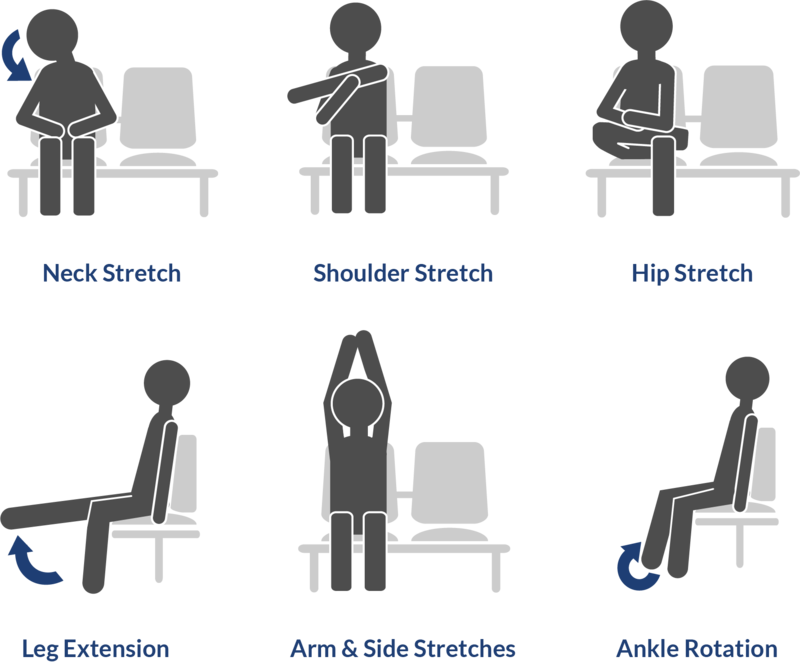 Some options here at the airport are taking a brisk walk, climbing the stairs, doing lunges or squats in place or trying some gentle stretches in your seat. Try a neck stretch, a good shoulder stretch, a hip stretch, a few leg extensions, some arm and side stretches, or even ankle rotations. Distraction is another way to take your mind off your worries and focus on something more enjoyable. Read a magazine, get into a good book or play a game on your electronic device to help shift your mind off the rush of travel. If you’re headed on vacation, why not write yourself a list of things you want to see at your destination? If you’re at YVR, pick up CMHA’s Colour Me Calm colouring booklet at Pre-Security YVR Information Counters. Many people find that colouring helps them slow down, focus on the present and gain a feeling of calm. It can be part of a mindfulness practice for kids and adults too! It may be too late to plan ahead for today, but if you find travel stressful, it helps to give yourself extra time when you need to fly. Sure, you could rush through traffic and make your flight. But you could also leave an hour earlier, take your time and breathe easier knowing that if you do hit a delay, it won’t risk your whole schedule. When you come to the airport early, you have time to appreciate the original works of art here at YVR or grab tea and enjoy airside views from the Observation Area, located before security in the Domestic Terminal. Drinking water to stay hydrated helps you handle stress more effectively. Airplanes are more dehydrating because the air in the cabin is kept drier. Avoid caffeine and alcohol before your flight because they lower your ability to deal with stress. Water is always a good choice, particularly when travelling. If you bring an empty water bottle in your carry-on, you can fill it with water after you’ve gone through security. Being a considerate traveller helps everyone arrive at their destination feeling more relaxed. Making sure your luggage doesn’t use up extra seats, moving out of someone’s way or helping with a stroller are simple things you can do to help those around you. These courtesies make the airport experience better for everyone. We’re all in this together! Did you know that turbulence is just a change in the air around your plane? Like water, currents of air move up and down, ripple out and change direction, speed and density. Some causes of turbulence are easy to see and avoid. Thunderstorms push air up and down, so your pilot will avoid the worst of the storm. Airplanes themselves cause turbulence, which is one of the reasons air traffic controllers give airplanes a lot of space (and why you might have to wait to take off). Other causes of turbulence are not easy to see, such as changing wind currents or ripples created as air currents move up and down over mountains. The most important thing to know is that turbulence isn’t dangerous. Even in the most severe turbulence, your plane is only moving a few metres. The real danger to passengers is injuries caused by falling or getting bumped around the cabin. It’s a good idea to keep your seatbelt on whenever you’re in your seat, even when it isn’t required. Sounds are a common source of worry during flight. Many people listen for sounds from the engines and different flight control surfaces and wonder if each change means that something is wrong. If you find that sounds cause a lot of stress for you, bring headphones for your flight’s entertainment system or bring your own music or audiobooks to keep your ears focused on something else. You could also try bringing earplugs. In or out of the lines. YVR has collaborated with the Canadian Mental Health Association to create an on-the-go colouring book to help you relax when travelling. 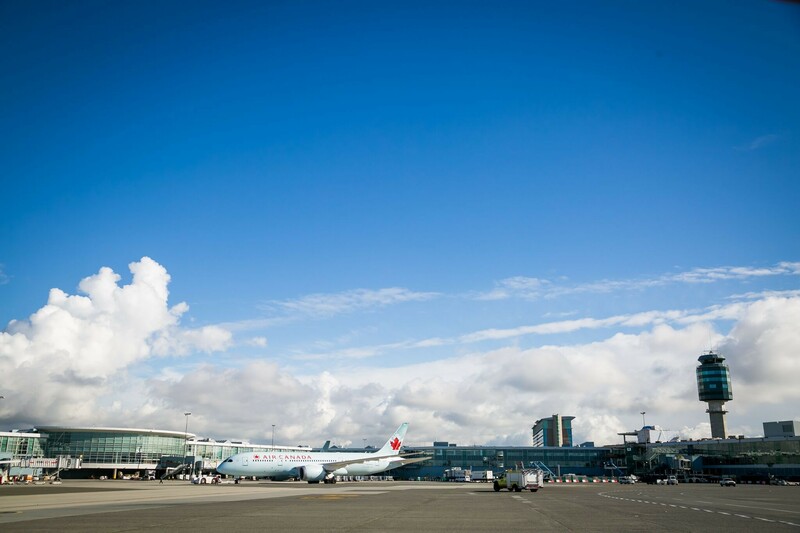 At YVR, we strive to offer a positive experience to all travellers who visit our airport. Universal access is a fundamental component of customer care at YVR. We look at all aspects of the airport travel, experience from how we design the airport terminal to the customer care services that we provide. We want everyone to be able to fly comfortably through YVR and are committed to providing the best possible airport environment for customers of all abilities. 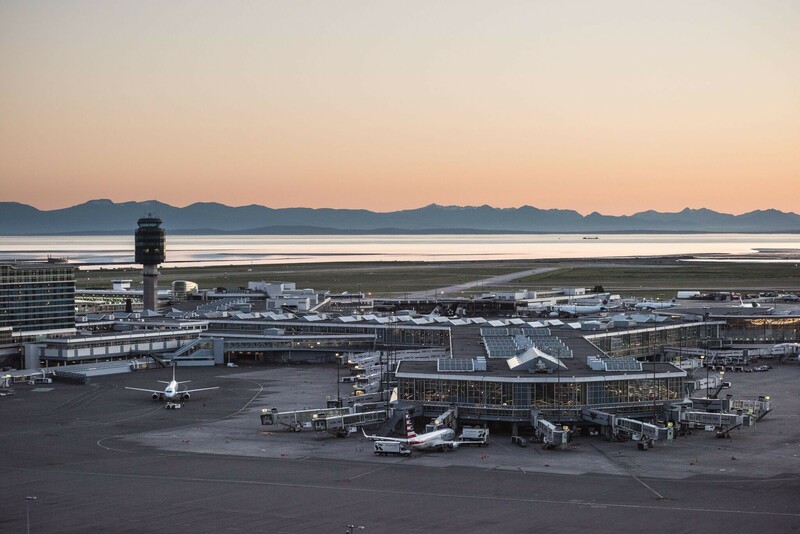 YVR aims to make navigating the airport a breeze, from increased accessibility to creating a calm and stress-free travel environment. Facilities include a quiet area designed for relaxation and meditation and a chapel with a prayer room to offer personal, social and spiritual needs for travelling. YVR is equipped with mobility, hearing and vision loss friendly environments to improve accessibility, such as aircraft gates crafted with wheelchair equipment lifts, pet relief animals for those travelling with assistance animals and low mounted flight and gate information for ease of reading. Art Therapy: Lining the halls of YVR is an abundance of indigenous art. From sculptures to wooden Totem poles, each area is adorned with its own unique pieces. Learn more about the art you can find at YVR here. Living Wall: A Living Wall not only brightens up the airport, but it also helps maintain the air quality. YVR’s living wall is designed to dampen the sound from the Canada Line, so there is less hustle and bustle heard from inside. Responsive Lighting: The lighting at YVR is designed to turn off, dim and brighten when necessary, so, if needed, you can catch a peaceful nap before your flight. Our Customer Care Volunteers dress in distinct Green Coats and are located throughout the airport to help point you in the right direction and answer any questions you might have. In addition, our Customer Care Volunteers in the blue jackets are available to make sure your experience at YVR is the best it can be. Even in times of stress, YVR is always there to help. Customer Care counters are open 24 hours to assist with finding flights, airport and general tourism information, maps and messaging services in 170 languages. Look for the Ambassador Dogs through our Less Airport Stress Initiative (LASI). Dog therapy is proven to reduce stress, which is why YVR has collaborated with St. John Ambulance to bring their furry friends to help you catch your flight. They are here Monday through Friday, from 11:00 am to 1:00 pm. For more information visit our website. Additional reading to help you travel with ease. Turbulence is just some sort of change in the air around your plane. Air isn’t nothingness; it’s a fluid, like water. For many people, a lot of stress around travel comes down to uncertainty. Will I make my flight? Find a wealth of information, access help, donate or join us in speaking up for better mental health and addictions services.